If you have a competitive streak and want to challenge yourself, a triathlon could be a great choice to take you to the next level. You can do it even if you don’t yet know how to swim and have never run a day in your life. The key is to take it in small steps until you can hardly wait to find one in your own neighborhood. July and August are a great time to start. How DO winter Olympians train for their big moment? If you are like us, you may have gotten caught up in "Olympic fever". There are many a champion that have been inspired to go for it after watching an Olympic games. In honor of the winter Olympics, we thought we'd share this article with you about how Olympians from various disciplines train for their winter events. You can read the full article here. "Olympic athletes train year-round for their moment in the spotlight. And. Strength Training over 90 – it’s good for you! 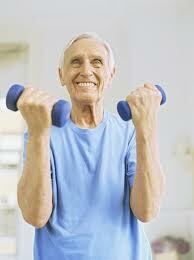 After doing specific training for 12 weeks, people over the age of 90 improved their strength, power and muscle mass. This was reflected in an increase in their walking speed, a greater capacity to get out of their chairs, an improvement in their balance, a significant reduction in the incidence of falls and a significant improvement in muscle power and mass in the lower limbs. These are some of the outcomes of the.